Read more about prestressed hollowcore, and the advantages it has over other construction products. 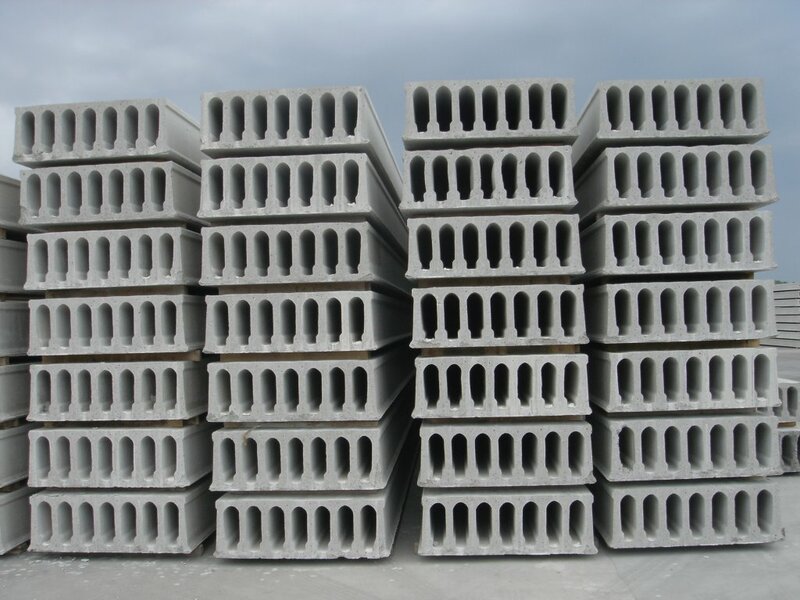 Hollowcore slabs are prestressed and precast concrete elements, manufactured using long line steel casting pallets. They are typically 1200mm wide (but can range from 600mm – 2400mm), and between 150mm – 500mm deep. Spans can be anywhere up to around 20m, and applications range from individual houses to residential apartments, office buildings, hotels, schools, hospitals, supermarkets, industrial units and car parks. Longitudinal voids, or cores, run throughout a hollowcore slab. These reduce raw material consumption, the self-weight of slabs themselves and provide ready-made ducts for services. As advancements in the construction industry continue, hollowcore has an important part to play. 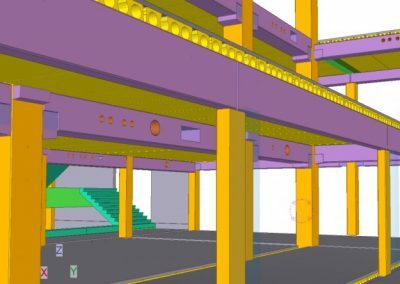 BIM (Building Information Modelling) gives architects, engineers and contractors the ability to design, plan, construct and maintain buildings more efficiently. Made to match the requirements of the end user, prestressed hollowcore is designed using 3D CAD software, and manufactured off-site under factory controlled conditions. Additional detailing of the slabs, such as cut-outs, narrow width units and shelf-angles, are all carried out in the production environment. Planning of manufacture and delivery to site can be co-ordinated for maximum efficiency. Prestressed concrete, and hollowcore slabs in particular, offer exceptional structural efficiency. Long spans and shallow units allow for low material usage, and better use of space within buildings. Hollowcore is extremely durable, retaining its structural capacity for a lifespan of 100 years or more. Production of elements in a controlled factory environment reduces waste, noise and emissions. Concrete has a large part to play in the heating and cooling of buildings, which consumes large amounts of energy. 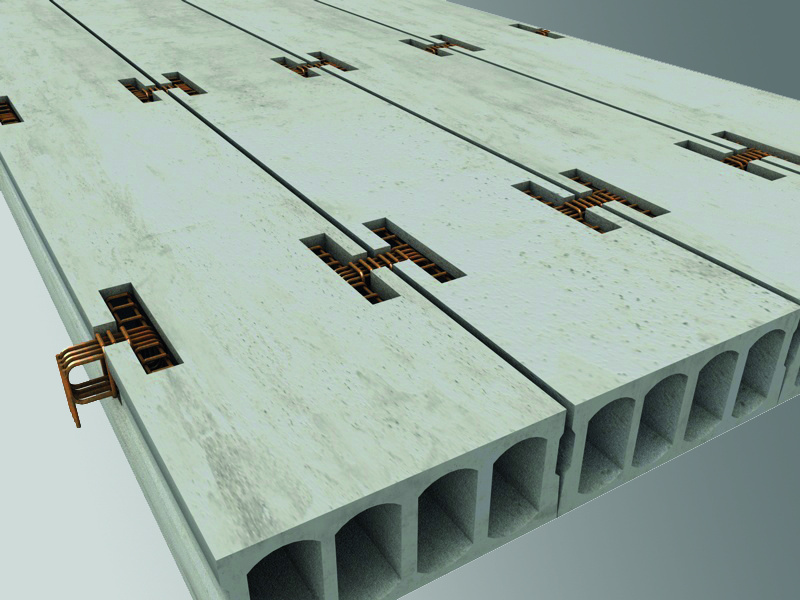 Hollowcore slabs contribute to the thermal mass of a building, and innovations such as TermoDeck enable reductions in the energy used for air conditioning. Hollowcore slabs can be installed quickly and safely on-site in variable weather conditions, unlike in-situ concrete. 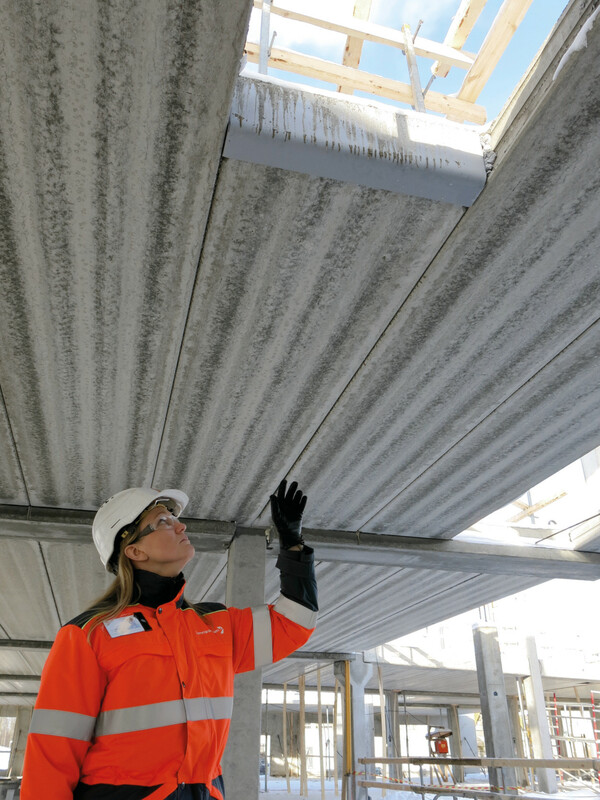 They reduce the number of workers needed on-site and provide an immediate unpropped working platform. These benefits allow much faster completion of flooring and quicker erection of buildings, increasing profits for the contractor. Hollowcore slabs are prestressed. Pretensioned concrete allows for shallower elements, reducing the amount of steel and concrete needed. As they can achieve long spans unsupported, this can also reduce the need for other supporting frame elements, such as columns and beams. Cores that run longitudinally through hollow core slabs mean that up to around 50% of the floor is void. Hollowcore slabs are lighter in weight due to the cores or voids that run through their lengths. As they are prestressed with steel wire and/or strand, spans of up to 20m are perfectly feasible. Hollowcore offers a versatile solution in steel, masonry and concrete structures. High span/depth ratios when compared to other flooring methods make them suitable for a wide range of applications, from housing, to commercial and industrial buildings, car parks and sports stadia. Wide, column-free interiors give more flexibility in building design and usage. Hollowcore is an extremely durable construction product, offering an exceptional lifespan through resistance to corrosion and cracking. 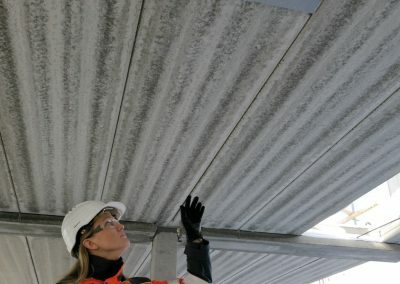 As it is produced in a controlled factory environment, it also enables the reduction of waste, noise and emissions during the entire construction process. Prestressed hollowcore requires the use of high quality raw materials, such as high strength concrete, and low relaxation steel wire/strand. Strict quality assurance procedures and controls can be applied throughout the production process, ensuring that the product meets the required national and international standards. Depending on the profile of the slab, hollowcore can be up to 50% or more in terms of void/solid ratio. This means that corresponding supports and elements within the structure can also be lighter in weight. In certain conditions, such as seismic activity or high winds, lateral forces are transmitted through the floor of a building. 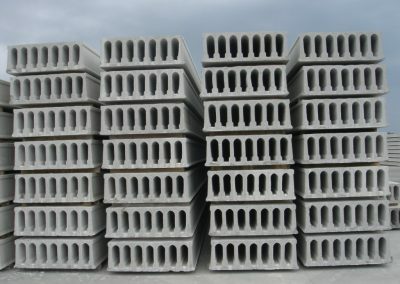 Hollowcore slabs can be used to provide a rigid single unit, and therefore a diaphragm action under such conditions. 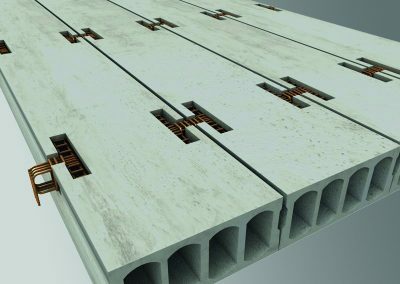 Hollowcore floors meet all accepted standards and design requirements for fire resistance within a building. IPHA has been instrumental in research on performance of hollowcore under fire, as evidenced by the Holcofire project. When compared to solid units, prestressed hollowcore can provide superior sound insulation, an important consideration when used in residential buildings. The cores/voids found in hollowcore slabs provide natural ducts for services such as electrical cables and plumbing. Hollowcore slabs offer excellent thermal characteristics, helping to reduce energy consumption used in the heating and cooling of structures.